A Rollover is a vehicle accident where the vehicle turns over on its side or roof. There are several causes for rolling over besides turning too sharply while moving too fast. Other causes are: tripping, excessive cornering, collision with another vehicle or object, or traversing a critical slope. Most rollovers of light vehicles (passenger cars, pickups, vans, and SUVs) are from tripping, that is the vehicle rolls over after leaving the roadway striking a curb, soft shoulder, guard rail, or other object that “trips” it. Excessive cornering rollovers occur as a vehicle rounds a corner and three forces act on it: tire forces, gravity, and inertial effects. Cornering forces from the tire push the vehicle towards the center of the curve at ground level, while inertia acts horizontally through the center of the vehicle in the opposite direction that it is turning. These two forces make the vehicle roll towards the outside of the curve with the force of the vehicle’s weight acting downward in the opposite direction. Thus, when the tire and inertial forces are more than the force of gravity, the vehicle starts to turn over. Most passenger vehicles (with centers of gravity closer to the ground) will slide or spin before this happens. This type of rollover is common for taller vehicles including light trucks (SUVs, vans, pickup trucks), busses, and heavy trucks. Rollovers can occur from a collision with another vehicle or object as well. A vehicle can become unstable when it collides with an object near the ground that causes one side of the vehicle to accelerate upwards, but not the other. Side impact will accelerate a vehicle sideways, and the tire resistance causes a vehicle rollover. Rollovers also occur when a vehicle crosses a steep ditch, embankment, or slope. Any vehicle is susceptible to a rollover. Generally speaking, a vehicle with a higher center of gravity is more likely to experience rollover. SUVs and vans are particularly notorious for rolling over because they often have a higher center of gravity. This is further exaggerated when a vehicle’s suspension is raised to accommodate 4-wheel-drive. Passenger vans which have raised heavy-duty suspensions and are used with a heavy load of passengers are also prone to rollover. The National Highway Traffic Safety Administration (NHTSA) official brochure** on 15-passenger van safety states, “15-passenger vans are not like smaller passenger vans and minivans and have a higher rate of rollover under certain conditions.” The NHTSA data shows that there is a significant increase in rollover risk when the van is fully loaded with the driver and passengers, and strongly suggests not to store cargo on the roof which further raises the vehicles center of gravity. The NHTSA suggests that the main cause of fatal rollover accidents of 15-passenger vans involves tire failures. Keeping proper tire pressure, and being aware that tires deteriorate over time, can help minimize the risk of tire failure. Also, the electronic stability control (ESC) systems on all newer model 15-passenger vans can assist drivers in maintaining control of their vehicles even during extreme steering maneuvers or on slippery roads. The ESC systems may help prevent rollovers, but vans produced prior to 2004 likely do not have this technology installed. A U.S. Transportation Research Board study in 2003 found that SUVs and pickup trucks are significantly less safe than passenger cars, that imported-brand vehicles tend to be safer than American-brand vehicles, and that the size and weight of a vehicle has a significantly smaller effect on safety than the quality of the vehicle’s engineering. 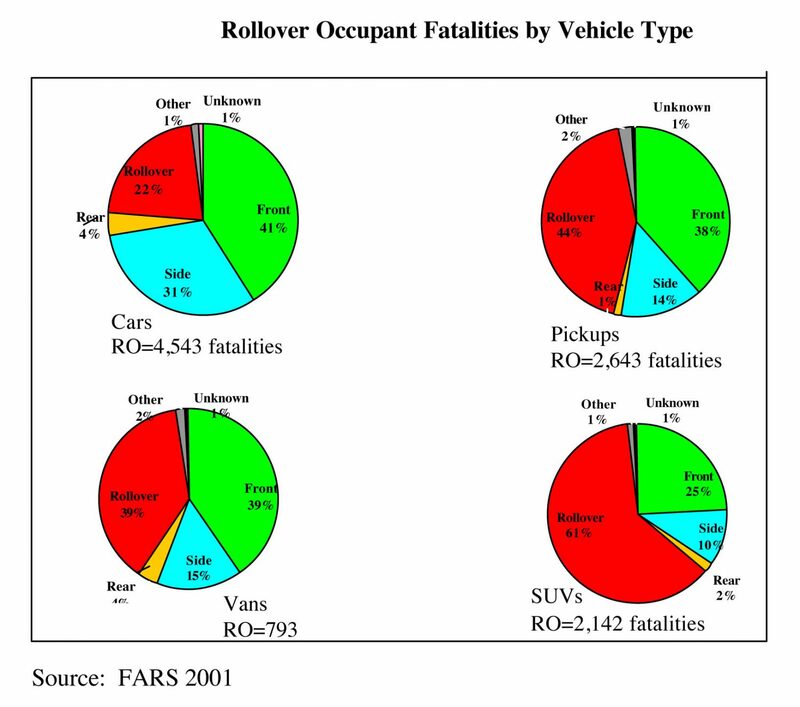 Cases of occupant deaths from unreinforced roofs during a rollover car crash. Recent rollovers and crashes in 15 passenger vans have caused multiple deaths and severe injuries across the country. These vehicles, often used by churches, organizations and college sports teams have a 3-6 times greater risk of rollover when they are fully or near fully occupied, as the increased load raises the center of gravity. These vehicles include the Ford E350, Dodge Ram Wagon B350, Ram Wagon B3500, Chevrolet Express 3500, the GMC Savana 3500 and Rally Vandura G 3500. Federal law prohibits the sale of the dangerous 15 passenger vans for school related transportation of students in high school or younger. Further, the National Highway Transportation Safety Association (NHTSA) has issued special safety recommendations regarding the operation of these vehicles. Ford, the manufacturer of the E350 stated in September 2002 that the drivers of its 15 passenger vans should have special training to reduce the risks of rollover. Further, many insurance companies will no longer insure these dangerous vehicles. If you, your loved ones, family members have been injured or killed by one of these defective products, contact Gary C. Eto.